Despite warming air temperatures in the Sierra Nevada, a recently published study by scientists from University of California, Davis, suggests spring snowpack in the Sierra Nevada is the biggest predictor of summer warming in the region’s small alpine lakes. The study, which was published in December 2018 in the journal Limnology and Oceanography, examined more than 30 years of climate and lake temperature data at Emerald Lake, comparing water temperatures to spring snow levels. “We were surprised by the strength of that relationship and the degree of predictability it gave us,” said lead author Steven Sadro, a UC Davis assistant professor in the Department of Environmental Science and Policy and a member of the Tahoe Environmental Research Center. “Across all those years there was a very strong relationship between the amount of snow in the basin in any given year and for example, maximum summer lake temperature or average annual lake temperature. Research at Emerald Lake showed summer air temperatures are warming at a rate of 1.5 degrees Fahrenheit, per decade, which according to Sadro, is as high as anywhere in the world and matches what has been recorded in the Arctic. Though air temperatures are rapidly rising, Emerald Lake’s water temperatures have been in part buffered by years of average to heavy snowfall. In drought years, however, the warming trends are consistent with the rate of warming found in other lakes around the world, according to Sadro. This past summer, Sadro and a group of UC Davis limnologists and colleagues began an effort to expand upon the research by installing instruments in nearly 20 lakes stretching from Castle Lake in Northern California to Emerald Lake. The group hiked to and camped out several days at each site, paddling the lakes with a sonar unit in tow in order to map the water depth while also sampling water chemistry and collecting other measurements. The lakes that are being looked at are above an elevation of 6,500 feet and vary in geography, which will provide researchers with a greater understanding of how snow affects lake temperatures across the Sierra. “The relationship between snow and lake temperature should vary across lakes because of a bunch of little factors like lake size, lake depth, the elevation of the lake,” said Sadro. “If we can take this principle here — that snow is really important in governing lake temperature — can we take the next step in trying to figure out how does that temperature get tweaked at different lakes, at different locations or different elevations or because of different shapes of the lake? There is one lake being monitored in Desolation Wilderness, according to Sadro, and another in the Tahoe Basin, but due to permitting issues the names of the lakes aren’t being disclosed. 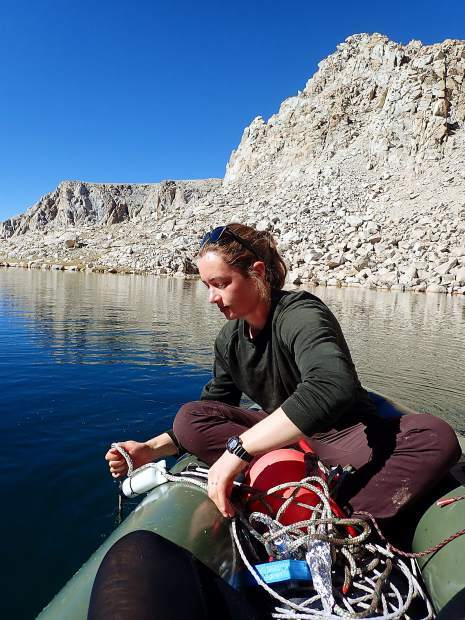 Though it’s still very early on in the study, Sadro said data from this past summer has shown that the alpine lakes in the Sierra began warming at roughly the same time. A companion study at Emerald Lake that was published last June in Water Resources Research showed changes in snowpack also increase the abundance of phytoplankton. While more phytoplankton could mean more food for other lake organisms, it could also negatively impact clarity and affect ecosystem health. The amount of snowfall the Sierra Nevada receives in the future will be a driving factor in what happens with the region’s small alpine lakes. “In part, what’s going to happen with the lakes is going to be highly dependent on what happens to the snow,” said Sadro. “There are some models that are saying in 100 years there won’t be anymore snow in the Sierra. There are some models that say snow might actually increase at some elevations or decrease at other elevations. The take home message is there’s a lot of uncertainty still in our predictions of what’s going to happen with snow and our ability to understand what’s going to happen to lakes is really going to hinge on what happens to snow,” said Sadro. Read our E-edition from your preferred device. Our mission is to provide readers with a deeper understanding of the Lake Tahoe and Truckee region. Whether it’s delightful dining options, fun things to do or amazing outdoor recreation opportunities, we have you covered.